Wrap a method in a spy in order to record calls to and arguments of the function. The object that has the method to be wrapped. Unlike most Cypress commands, cy.spy() is synchronous and returns a value (the spy) instead of a Promise-like chain-able object. cy.spy() returns a Sinon.js spy. All methods found on Sinon.JS spies are supported. Adding an alias using .as() to spies makes them easier to identify in error messages and Cypress’ command log. cy.spy() creates spies in a sandbox, so all spies created are automatically reset/restored between tests without you having to explicitly reset/restore them. Cypress has also built-in sinon-chai support, so any assertions supported by sinon-chai can be used without any configuration. cy.spy() requires being chained off of cy. 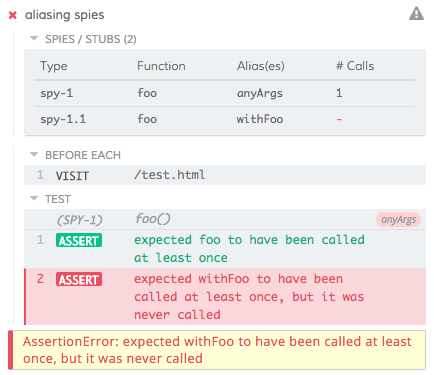 cy.spy() cannot have any assertions chained.